Earlier this week, I spent quite a bit of time at Hammonasset State Park. Because I had some time to kill, I went to Hammonasset Point – the area just south of Rock Pond, at the start of the Moraine Trail, which sits in a separate atlas block from the rest of park. My goal was to see what I could find that was nesting right in the tiny piece of land that is in block 120B. Google Earth image of Hammonasset Point. Red line indicates the boundary between block 120B (below the line) and 98F (above the line). Part of Meig’s Point parking lot is visible top-left. Although nesting habitat is largely limited to the bushes around the small parking lot at the point, I was able to confirm four species, and come up with probable evidence for several more. But, I also had a couple of observations that highlight the problems with birding close to block boundaries. First, I saw a number of species either in the pond (egrets, ibis) or flying over (osprey, cormorants, gulls) that were clearly not nesting in the block. Although, some (mallard) were using habitat that is suitable for the species, the H code was not appropriate for most of them as it would indicate that there was suitable breeding habitat present. Instead, the X (observed only) breeding code would be appropriate for these. If you are an eBird user there is no X on the drop-down menu, but if enter a count or an X in the count box it will be treated as an X breeding code. Second, and more worrisome, was that I saw a number of common grackles carrying food and then flying inland, across the block boundary. Presumably, these birds were collecting food to feed to young in a nest in the adjacent block. Although, it would be correct to say that I saw a grackle carrying food for young, it would clearly be misleading to use the CF breeding code for block 120B, since the evidence suggests these birds were not nesting in the block. So, for these birds I used only the H code. Subsequently, I learned from Micky Komara that there is at least one grackle nest in the block, so the species can be confirmed based on that. 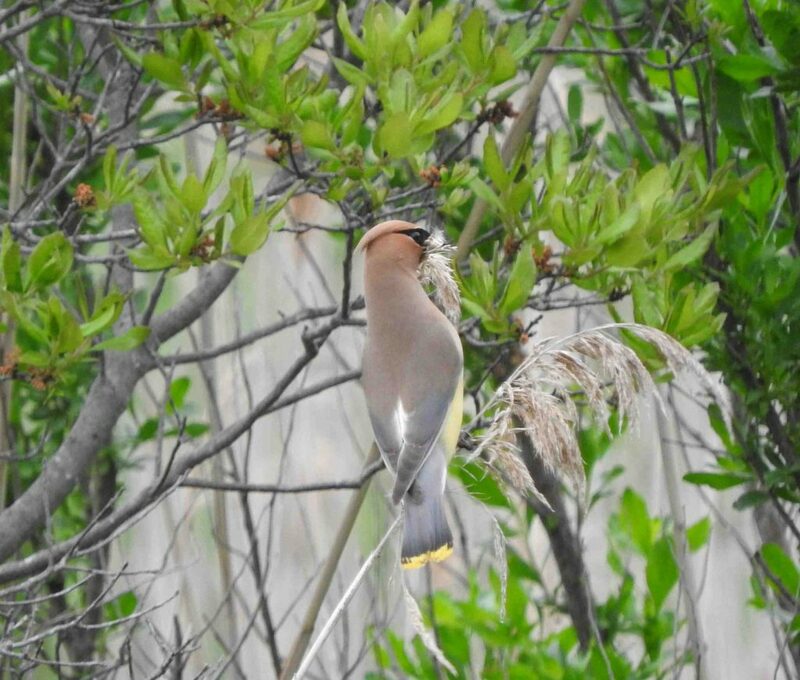 This cedar waxwing and its mate were seen repeatedly gathering Phrgamites fluff and taking it to a nest site that was a few meters away (and inside the block). This behavior confirmed breeding for block 120B. In contrast, this common grackle was seen to gather food in 120B, then to fly across the block boundary, presumably heading to a nest in block 98F. This behavior did not confirm breeding for block 120B, although the separate discovery of a nest in the block shows that the species does breed there. The main point of this example is that, although we try to keep the protocols simple, there are always cases that stretch the application of breeding code definitions. Consequently, it is always good to keep in mind the ultimate goal – to produce a list of species that are actually nesting in a block. When you are close to a block boundary, some codes can be especially tricky. 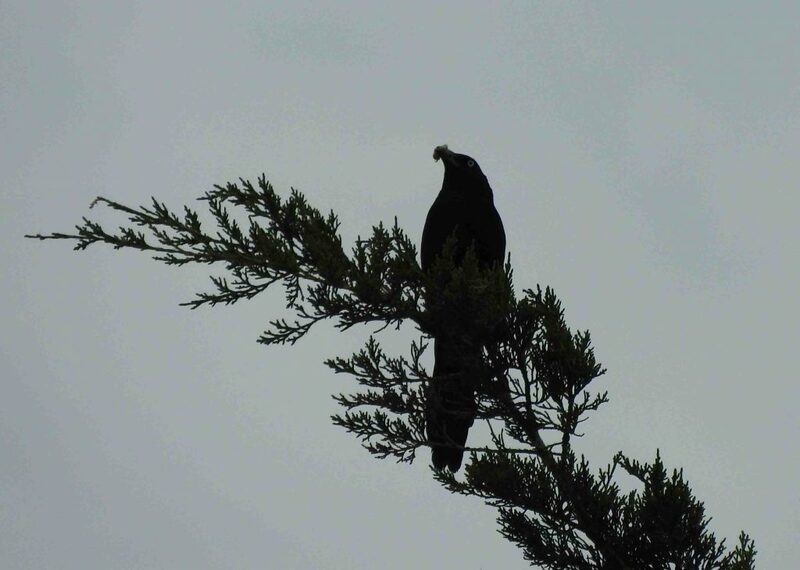 Confirmation codes that involve actual nests are generally straightforward, but CF (carrying food for young), CN (carrying nest material), FY (adult feeding young out of a nest), and, especially, FL (recently fledged young) can all create ambiguous cases that require some deliberation.